This week in Trampoline House, you can: Attend the info meeting on how to become contact person for a rejected asylum seeker, bring your friends to the last Cinema Club of 2017, and much more. 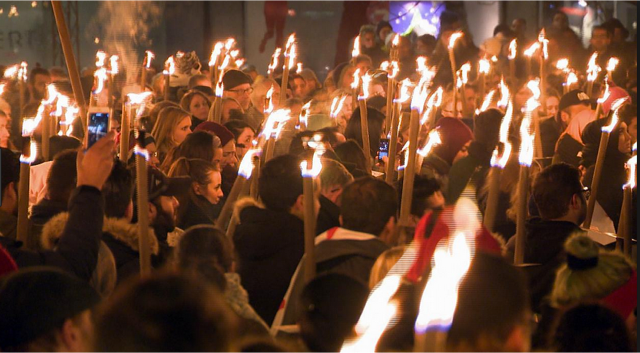 We incite everyone to attend this Saturday's torchlight procession to put focus on the living conditions for children and youth in the Danish asylum system. The procession is an initiative by the People's Movement for Asylum-Seeking Children's Future. This Saturday, December 16, at 3–5 pm, the children will lead as we march from Israels Plads down Fiolstræde and Strøget to Rådhuspladsen. Join the Torchlight Procession for Asylum-seeking Children's Future! CANCELLED: This Saturday, Women’s Club is cancelled because of the Torchlight procession for asylum-seeking children's future. This Monday (tonight) at 8–10 pm, we have an info meeting on how to become contact person for a rejected asylum seeker. A new network across Denmark is working to reach out to rejected asylum seekers. At this meeting you can hear more about the project, the conditions for people living in deportation camps in Denmark, and what it means to be a contact person – and you can sign up if you want. This Friday, Cinema Club will provide a cozy atmosphere in Trampoline House for the last time in 2017. We'll screen Charlie Chaplin's controversial masterpiece, The Great Dictator from 1940. The duration of the movie is 2h 5min, so we'll try to begin at 7 pm sharp. Along with a large group of Danish organizations, asylum-seeking children, families, and unaccompanied minors are inviting everyone to join a torchlight procession to put focus on the living conditions for children and youth in the Danish asylum system. Trampoline House is inciting everyone to attend on Saturday, where the children will lead as we march from Israels Plads at 3 pm down Fiolstræde and Strøget to Rådhuspladsen, where there will be music, speeches, snacks and coffee from 4-5 pm. Join and help create a popular majority to give asylum-seeking children in Denmark a normal and safe upbringing.